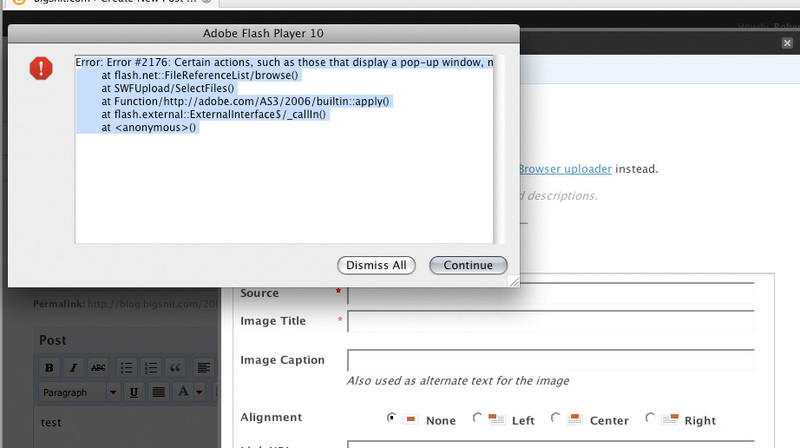 I’m not sure how I missed it, but if you’re a WordPress user and you love the image upload function, stay away from Flash 10. It borks the uploader – and you’ll need to revert to Flash 9 or use the browser upload instead. The WP forum ‘closed’ topic on image upload problems does mention this, but I hadn’t gone back to that doc since reading it the first time (trying to solve other image upload problems). The WP forum seems to indicate its an issue especially for Linux, but the WP Image uploader for definitely doesn’t work with WP on my Intel Mac when running Flash 10. Fortunately I was able to find my old Flash V9 player and reinstalled it. Error #2176: Certain actions, such as those that display a pop-up window, may only be invoked upon user interaction, for example by a mouse click or button press.